Jordan Sinnott's seventh minute strike was cancelled out by three Brakes goals as the hosts came from behind to win and stretch our win-less run in the league to five games. Billy made several changes with Tom Nicholson given his first league start in goal, James Clifton returned to the starting eleven with Jordan Sinnott replacing the injured Bobby Johnson. The Reds started the game very strongly and were moving the ball at pace, intercepting early and threading through the Brakes midfield with neat combinations. Bishop did have the first effort of the game for the hosts as he glanced a header wide from a free kick into the box after a few minutes. However with seven minutes gone, the Reds deservedly hit the front after a bright start and it was Jordan Sinnott who hammered home from close range after a James Clifton cross wasn't dealt with in the box. It was so close to 2-0 when Sinnott's cross on the left was right onto the head of Richard Peniket whose diving header was kept out from close range by Breeden. Alfreton were looking good with Tom Platt and Danny Clarke combining just outside the box but Platt's return pass was just too long. Successive corners for us followed from Sinnott which caused issues with their quality but soon Leamington grew back into the game with Bishop glancing a header wide again before our discipline soon wavered, several free kicks were earned by the hosts but we defended them well. Sinnott had a free kick which he put into the wall before the hosts grabbed an equaliser with 34 gone, a cross into the box wasn't cleared by us and Gittings reacted after the ball bounced around to tap home past Nicholson from a few yards. Dec Bacon then had a shout for a penalty turned down but soon our attack dried up and so did our ball retention. Peniket did well to win a corner but the ball towards Martin Riley was headed away. 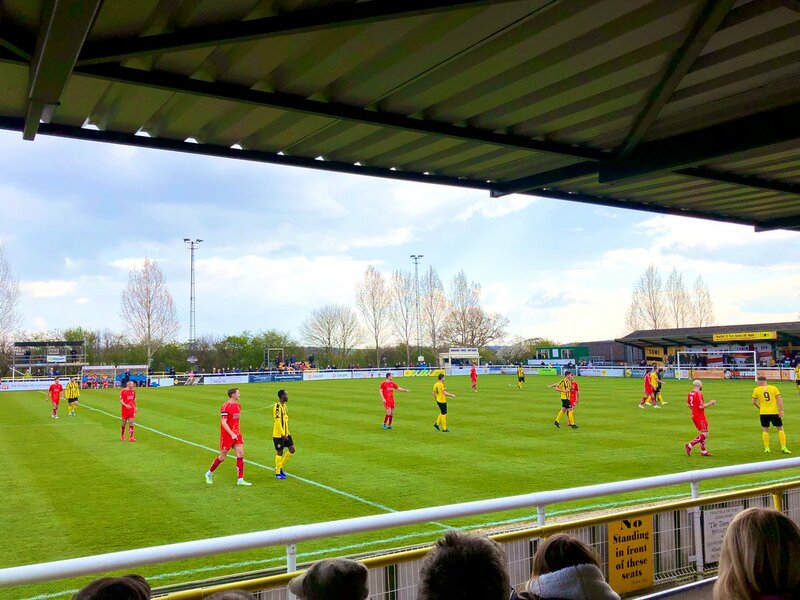 But Leamington finished the first half strongly pressing us in the final third, Clarke's effort was easy for Nicholson as the first half drew to a close. On 53 minutes the Brakes took the lead as Murphy was slid through in the box and he finished low across Nicholson who dived the wrong way in anticipation. The goal was deserved for the hosts who were full of confidence and they continued to move forward, Bishop crossed from the right side but no one in yellow could connect. On 61 minutes it looked like the Reds had equalised when James Clifton's effort from near 30 yards looked to have been spilled by Breeden with the ball definately looking like it crossed the line but the officials waved away the protests. Nicholson was forced into a stretching save to his right to deny Gittings before the Brakes did get their third goal on 69 minutes. Bishop turned in the box and smashed an effort off the bar from a few yards out and the rebound was headed in by the unmarked Edwards. Reece Styche was then caught in the box with the penalty claims brushed off, moments later Tom Allan was also caught but once again the Reds were denied a spot-kick. It was two huge moments in the game that went against Alfreton, as frustrations grew as time ran out. Bishop fired inches wide of the far corner before Styche cut inside and fired over the bar in the later stages. But that proved to be the last opening for the Reds who had key decisions go against them but the second half performance was disappointing after such a promising start to the game. Alfreton will look to get back to winning ways with just three games left to go, next up we face FC United of Manchester at the Impact Arena, kick off is 3pm. ATFCXI: Nicholson, Clifton, Wilde (Styche 65), Platt, Hotte, Riley (c), Bacon (Allan 52), Clarke, Peniket, Sinnott, Curry. Subs Not Used: Lynch, O'Brien, Ramsbottom.